MANNOL Dexron VI. This fluid is formulated with exceptional quality base fluids and advanced additive technology to provide outstanding oxidation resistance, friction durability, wear protection and shear stability. MANNOL ATF AG55. LAND ROVER TYK500050. JAGUAR C2C 8432. BMW 83220142516 (1375.4)/83220144137. Isle of Wight (IOW) - £6.75 per parcel, Zone C - £8.69 per parcel, Zone D - £12.15 per parcel, Zone E - £11.00 per parcel. Check Owner Guide and transmission fluid charts for application. Mannol Dexron II Automatic is a multipurpose multigrade oil for automatic transmissions, hydraulic steerage systems and hydraulic clutch. Has high performance specifications. Provides long durability of transmission components. The proprietary AMSOIL additives form an iron-sulfide barrier coating on gear surfaces, providing the ultimate line of defense against wear, pitting and scoring. New Products: Amsoil. AMSOIL Severe Gear is compatible with conventional and synthetic gear oils. Performance MTF-3 fluid oil dedicated for all Honda Manual and Auto-Manual (i-Shift) transmissions. This is how long our ‘heat test' for the Honda Timing Belt lasts. First, we heat a belt to 125 degrees for 70 hours. PEMCO iMATIC 465 D VI. GM Dexron VI. ZONE B - DD, DG, EH, FK, G, KA (except KA27 & KA28), KY, ML, TD, AB 1-16,AB21-25, AB30, AB39, PA1-19, PH1-PH3. Flash point D-92 °C min 216. Isle of Wight (IOW) - £6.75 per parcel,Zone C - £8.69 per parcel, Zone D - £12.15 per parcel, Zone E - £11.00 per parcel. SAE Viscosity: 75W90. Protects Against Wear & Heat in Severe Applications AMSOIL Synthetic Manual Transmission & Transaxle Gear Lube is specifically formulated to reduce friction and maintain viscosity for long component and fluid life. Pentosin ATF-1 Automatic Transmission Fluid 20L. OE Fluid for ZF 5 & 6 Speed. It is fully miscible and compatible with other DEXRON IID and DEXRON III ATFs, but does not show said superior performance when used blended. (Auto Gearbox Oil). Automatic Transmission Fluid. All Models with 6 Speed Auto Box (AF40). All Models with 8 Speed Auto Box (AF50). This will fit the following vehicles:-. Silverhook universal automatic transmission fluid (4.54 Litre) is a multipurpose automatic transmission fluid for automotive vehicles. It also has applications in many manual transmissions including Ford MT75 as fitted on Modern Transit vans. The automatic transmission is one of the most complicated mechanisms in modern automotive engineering and consequently requires complex fluids for efficient operation. Silverhook universal transmission fluid is manufactured from high quality solvent refined base oils, specially selected additives and friction modifiers to produce a lubricant with excellent oxidation stability and frictional characteristics. Silverhook are one of the largest independent manufacturers of automotive lubricants and chemicals in the UK. Silverhook was established in. AMSOIL Severe Gear is compatible with most limited-slip differentials. If limited-slip differential chatter occurs, add AMSOIL Slip Lock® friction modifier additive. AMSOIL Severe Gear provides performance beyond that possible with conventional gear oil. TORCO RTF RACE TRANSMISSION FLUID. TORCO RTF Racing Transmission Fluid is specifically engineered to reduce fluid drag for increased power efficiency without compromising component durability. RTF provides anti-score protection for high speed, high load and high torque shock-loading conditions, while allowing smooth operation of synchronizers. Product application prolongs the life of the whole transmission system and allows avoiding expensive repairs in the future. One syringe of XADO Maximum Transmission (30 ml) is for transmission assemblies with the oil system up to 4 qt. Genuine Toyota Automatic Transmission Fluid. Suitable for Most Toyota Hybrid Family of Automatic Gearbox. TORCO TYPE F LIMITED SLIP FRICTION MODIFIER. TORCO LSA is formulated for use in clutch plate type limited slip and posi-traction differentials to reduce hypoid gear noise and chatter. It can be used to modify clutch plate friction for applying and releasing clutch plates to fine tune the performance of the LSD. Products that are ordered in error or that you changed your mind on will be entitled to a credit note at our discretion. This does not affect your statutory rights. Genuine Subaru automatic transmission oil. OEM index K0410Y0700. Not only have we all the necessary knowledge about the distinctive construction of Subaru cars, but also we own and drive them ourselves. Range Rover L322 New Genuine Castrol BOT 26 FMB1 Transfer Transmission Oil (1 Litre). Why only Genuine Land Rover parts are good enough! They fit, and stay fitted, genuine parts are tested to work perfectly over many years. MANNOL Basic Plus 75W-90 API GL 4 . Basic Plus 75W90 GL-4 is a fully synthetic high quality transmission oil for lubrication of the transmission gears with integrated differential gears. Provides high differential gears protection and increases their life circles. The product is formulated to provide an inherently higher VI using synthesised base oils to provide stronger film strength at higher temperatures than mineral oils, without the addition of VI improvers. 100% GENUINE PRODUCT. WE ARE ALSO NOT RESPONSIBLE FOR ANY LABOR EXPENSES, TOWING EXPENSES OR RENTAL CAR EXPENSES CAUSED BY THE USE OF WRONG OR DEFECTIVE PARTS DURING INSTALLATION. OEM CODE: 38325-AA032. The proprietary AMSOIL additives form an iron-sulfide barrier coating on gear surfaces, providing the ultimate line of defense against wear, pitting and scoring. AMSOIL Severe Gear is compatible with conventional and synthetic gear oils. XADO’s Revitalizant technology has been independently tested and proven to work. Because it has a self-regulating maximum thickness it does not cake. Operate the car as usual. Compared to XADO gel-revitalizant for automatic transmissions. 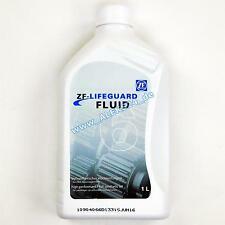 Land Rover Freelander 2 Automatic Transmission Fluid (1 Litre). Suitable for Freelander 2 (2011 - 2014) & Range Rover Evoque (2012 - onwards) vehicles with 6 speed automatic transmission. We only deal with the Land Rover. FULLY COMPATIBLE WITH ALL TRANSMISSION APPLICATIONS WHERE ATF , ATF 2 & ATF 3 AUTOMATIC TRANSMISSION FLUID IS SPECIFIED. - ATF 4 Mopar fluid 5L. CHRYSLER GRAND VOYAGER 2008-2013 (RT) - ALL ENGINES WITH 62TE TRANSMISSION.